Dr. Null sees your drawings of monsters and superheroes and robots and speed lines and grimacing muscle men and cutesy little women with the enormous wassermelonen. Dr. Null is not impressed! Nor does Dr. Null believe you are capable of surviving the very first Penciljack challenge. In fact, Dr. Null believes you will FAIL. MISERABLY. And Dr. Null will gleefully perform the glorius Bayerische gerne tanzen when you do. But enough about Dr. Null's hobbies. 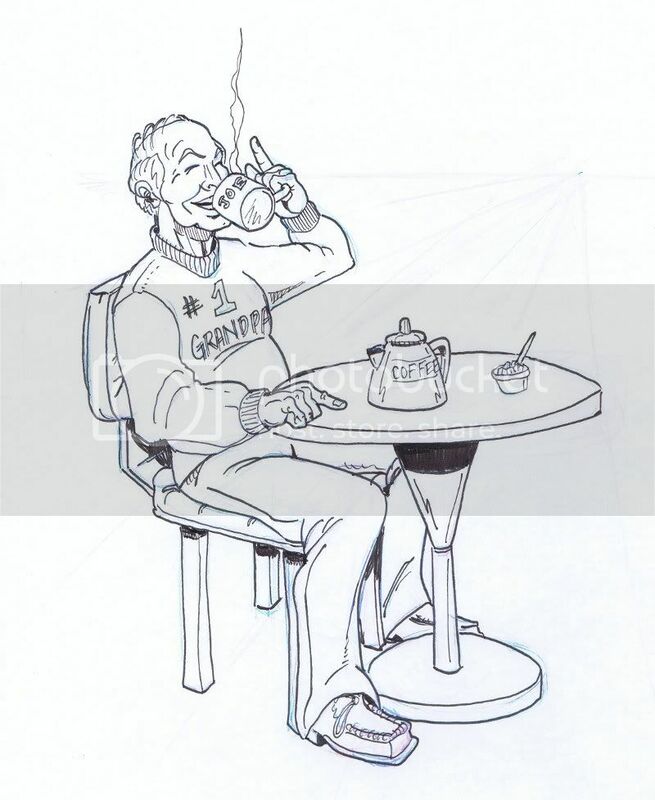 Draw a middle-aged asian man or woman sitting at a small table drinking hot coffee from a mug. Simple, you say? WaHAH! Dr. Null awaits your paltry attempts to fulfill this challenge. Post your drawings here, you silly little bleistift affen, so that Dr. Null may revel in your failure. Time to brush up on my German - I like to know when I'm being insulted! I accept, if for no other reason than to finally have an excuse to use a mug of hot coffee as a reference... Also, I have a strange compulsion to appease angry demonstrative German scientists. Do I Look Iconic Enough? You can't fool me into drawing with ambiguously insulting German fodder and doubts of my superior talents. So I'll join of my own accord to prove you wrong. Also, is there like a deadline or something? See.....Dr Null is already playing with your mind. Unglaublich! Clearly Dr. Null must remind the little bleistift affe they were specifically challenged to draw a middle-aged asian man or woman DRINKING a cup of hot coffee from a mug. NOT HOLDING A CUP OF HOT COFFEE. Begreifen? This challenge is not so easy as you thought, eh? And don't go thinking you can use swirly little lines to try to trick Dr. Null into thinking the coffee is hot, meine kleine kartoffeln. You must SHOW Dr. Null the coffee is hot by way the man or woman is DRINKING it! WaHAH! This will test the limits of your traub-wie mastery of human facial expressions and body languages. Do you begin to see? NONE of you is prepared to meet this challenge! NONE OF YOU! WaHAH HAH HAH HAHAH AHAHA! Dr. Null's challenge shall pinkelt on your petunien! There is no deadline. Because you will not succeed. Dr. Null does not play with paltry children's toys! Why are you wasting time? It will take you from this very moment until the end of your days to even BEGIN to equal this challenge. Wait, Dr. Null understands now ... you are STALLING! Beginnen Zeichnung, Kunst Wiesel! Oooooh. He said "middle-aged". You're in for it now. Grandpas are not middle age that is old age. I am middle aged and I am not a grandpa.